Earlier this year, there was a health scare in Germany when an unknown internet savant asked supermarkets for a payment after he claimed to have contaminated baby food putting glass into several jars. The whole country followed the story and thanks to camera surveillance the culprit was quickly caught. A similar incident on the other side of the planet this time round as in Queensland, Australia, a $100,000 reward has by now been offered for any information leading to the capture of the “strawberry saboteur” amid fears six brands across four states have been targeted with needle insertion. So far, pictures have shown that any strawberries sold under the brands of Berry Obsession, Berry Licious and Donnybrook brands were affected. Meanwhile, the New South Wales police fear that a copycat is operating in the area as well and has started pinning needles into the fruit sold under the Love Berry, Delightful Strawberries and Oasis brands. 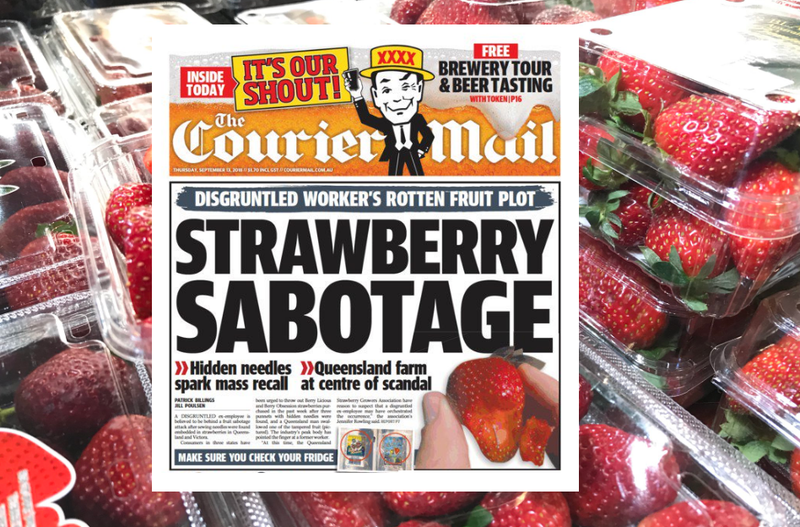 At this moment, a health warning to throw out or cut up strawberries is in place in Queensland, NSW, Victoria and South Australia as authorities hunt the culprits. Farmers have been forced to dump fruit over concerns it may contain needles.